This photo is so precious. This is definitely one to have on hand to emberess her later. TFS! And that bathing suit would make a great Courtney's closet if you use the photo that shows the front! This is just hilarious.....my grand daughter did sort of the same thing and kep on doing it also.......She does know she's cute, doesn't she? What a great Kodak moment, Libby!! She is such a doll!! 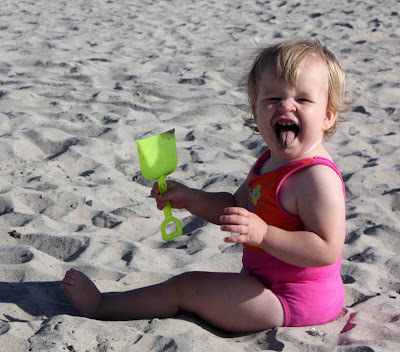 what is it about toddlers and sand. Mine were exactly the same. I just love the look on her face...priceless. Oh, it must have been wonderful! I can't wait to get away from it all this summer. It looks like you all were having a great time (I looked at the other photos, too). Welcome back, Libby!